In Legacy: Gears of Time, you are traveling back and forth through time trying to influence the past, to ensure that the technological advancement of the world remains intact. Each round you will be traveling back through time (back only) establishing new technologies and influencing already existing ones. 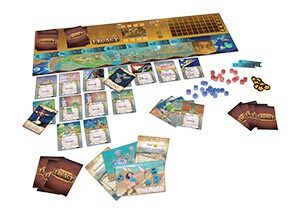 Each player will have 4 turns each round to play technology cards into a timeframe, place influence cubes, draw cards or to play one of the all powerful Fate cards. At the end of each round you will check to see which technologies are successful (You can’t have the steam engine if you have not discovered fire!) and the player with the most influence on each technology scores points. When a new round starts you travel back to the present and do it all over again. The Artwork in this game is very cool and extrememly unique and fits the theme well. The Board is good quality as are the cards. The wooden bits are fine and except for the gear tokens, are kind of generic. This game is VERY thinky and VERY interactive, so if you like those elements (and I do) is is very fun. However, if you do not like other people messing with your best laid plans (my wife does not) then you might find this game frustrating. This game is HIGHLY interactive with every play influencing something or someone else. I really enjoy this game. The theme is completely awesome and the gameplay makes forward thinking and trying to anticpate you opponents a must. Add a Review for "Legacy: Gears of Time"